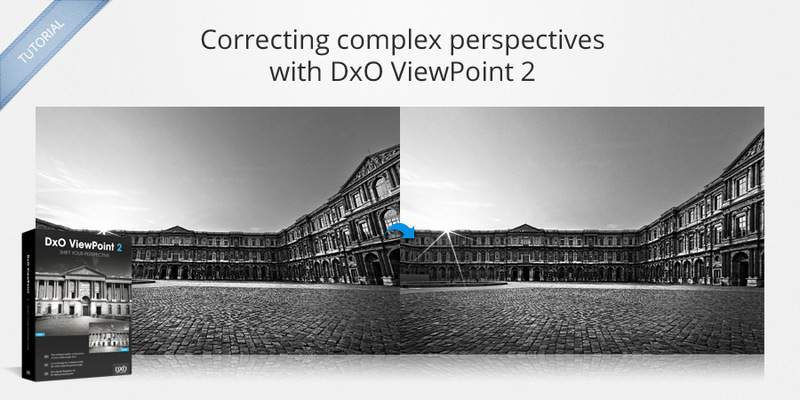 In this tutorial, we will show you how to use DxO ViewPoint 2 to correct the most complex perspective problems. You will learn how to use the new 8-point perspective correction tool and benefit from tips that will give you a perfect result with a maximum of efficiency. • Some photos in TIFF or JPEG format. • You can download our demo images HERE. Shooting with a wide-angle or ultra-wide-angle lens accentuates the distortion of perspective that occurs in direct relationship to how far the axis of the lens is from the horizontal plane. This is frequently the case in architectural photos, where the photographer cannot back up far enough, and thus is obligated to point the camera upwards to capture the entire subject. 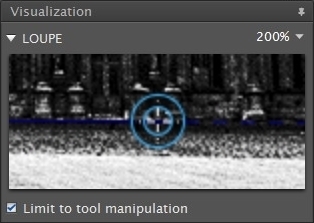 DxO ViewPoint 2 lets you correct these kinds of faults very efficiently, so long as you take a few precautions when shooting. As far as possible, keep your lens oriented as horizontally as you can, because the less serious a deformation is, the easier it will be easier to fix and the less cropping your image will require. Indeed, these kinds of corrections always result in the loss of some part of the image after processing, so you will need to take this into account when shooting and provide enough space around the subject so that your corrections will not adversely affect your composition. 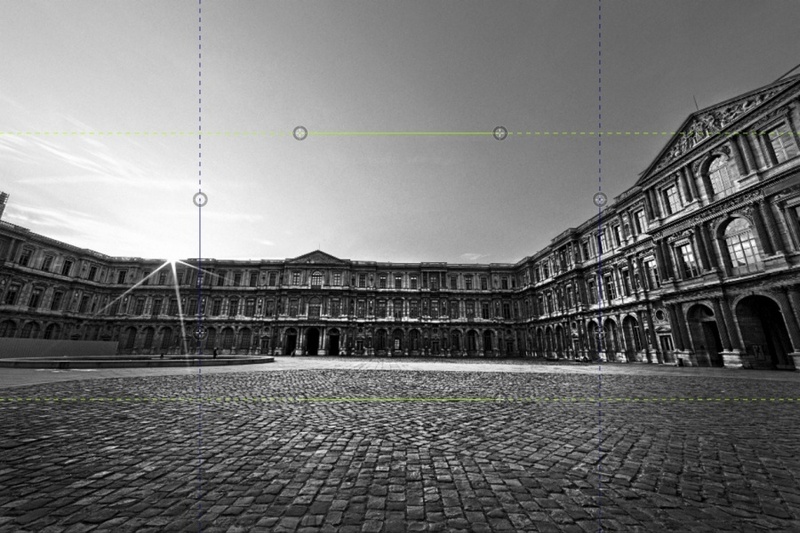 The image below presents all of the perspective problems and correction challenges that you might ever encounter: the plane of the photo is not strictly parallel to the camera; the vertical lines are not parallel; the two parts of the wall are not perpendicular; and an abundance of details make finding good reference points difficult. 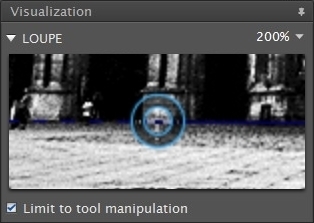 The corresponding graphic tools appear on the photo. You can thus change the color or each pair of lines independently. 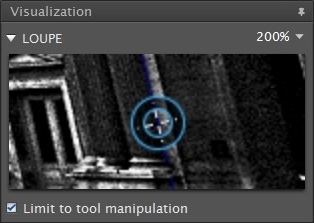 To place the tool’s anchor points as precisely as possible, use the loupe palette at right to zoom in on the image at 100% or 200%. The display is centered on the selected anchor point and will follow it when you move it. 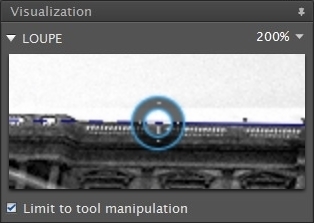 If you uncheck the “Limit to tool manipulation” box, however, the loupe display will follow the position of the mouse pointer. 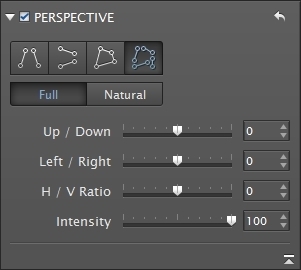 The 8-point perspective correction tool consists of two pairs of independent lines that can force horizontal and vertical parallels; each line contains two anchor points to give you more positioning flexibility. ); it has only 4 anchor points, each of which is located at an intersection of horizontal and vertical lines, and it is designed to rapidly correct simple perspective problems. We will begin by placing the horizontal lines, given that the reference points will be easier to find. To do so, click on the anchor points of the two lines in order to move them onto the axes that you want to make horizontal. In our photo, we are choosing to place the anchor points of our upper line on the terrace of the roof. 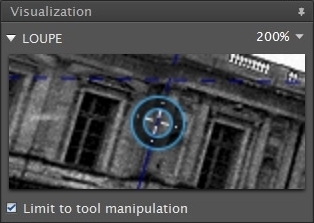 As positioning with the mouse is usually not very precise, use the loupe to zoom in and find reference points on which to position your anchor points in the image. Select an anchor point, which will result in the loupe displaying the area around it; set the loupe at 200% to see the details in the image. Then use your keyboard’s arrow keys to very precisely place your first anchor point. You can use the keyboard shortcuts TAB and SHIFT+TAB to go from one anchor point to another. Follow the same procedure to precisely position the two anchor points in the lower horizontal line. Here we are choosing to place them at the foot of the building. 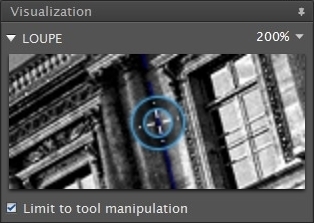 After the correction is applied, the horizon is automatically straightened, so it isn’t necessary to straighten the horizon beforehand. We will place the anchor points for the vertical lines in the same way. Here we will choose an axis on the left part of the façade and another on the right side which are far enough away from each other so as to get the best possible correction. The closer you place the anchor points, the greater the risk that you will not achieve a proper correction. 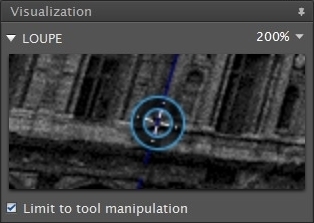 This is why we recommend you choose axes as far away from each other as possible in order to optimize the correction. Place the anchor points and then use the keyboard to adjust them with the help of the loupe. After you’ve placed the two anchor points on the guideline, make sure that the line is well-positioned. 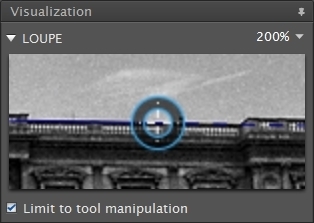 To do so, uncheck the “Limit to tool manipulation” box in the Loupe palette and then trace the line with the mouse: the loupe will follow the movement so that you can verify its alignment with the reference point you’ve chosen. 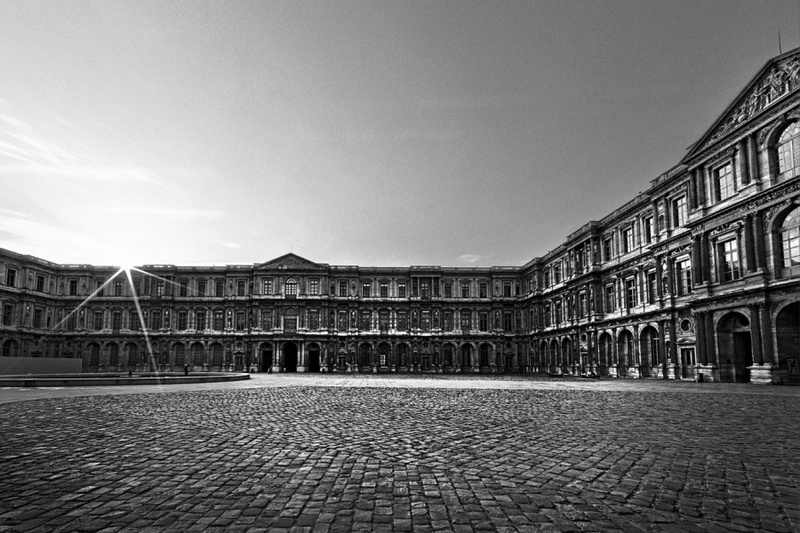 You will see both what the correction looks like as well as the necessary cropping. You may decide that the correction applied is excessive, mostly because human vision cannot rightly interpret too strict a rendering of parallel lines, and because some degree of convergence is normal in nature. 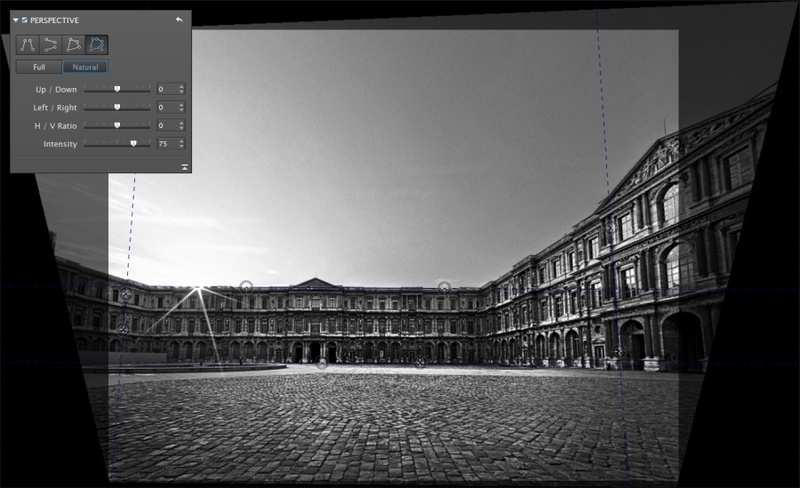 To give your result a more natural rendering, adjust the Intensity slider found in the Perspective palette. Set the slider here to 90. 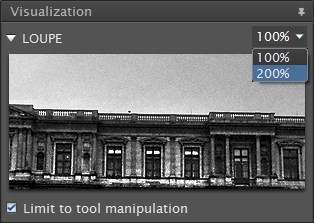 You can also choose the “Natural” instead of the default “Full” mode, which will automatically set the intensity to 75 instead of 100 to preserve a certain degree of natural convergence in the image. 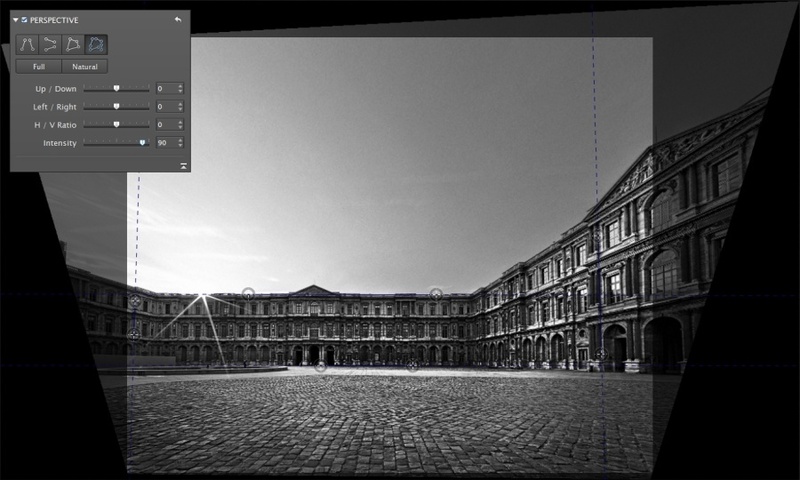 DxO ViewPoint 2 offers you an automatic crop tool that maximizes the space recovered after correction. 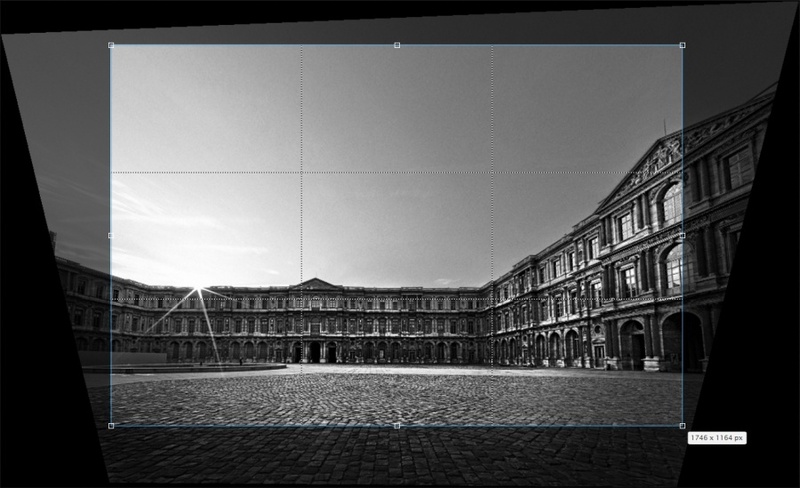 If you want to display or print your image in a standard format, choose from among the possibilities in the Aspect Ratio drop-down menu in the Croppalette. 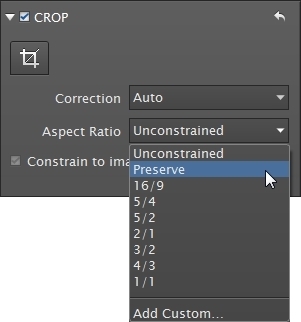 Choose the Preserve option to keep the same format as the original image, choose a predefined aspect ratio, or even choose your own pre-saved custom ratio for a different kind of crop. In case the format you choose is smaller than the space available after correction, you can move the crop rectangle to reframe the composition. 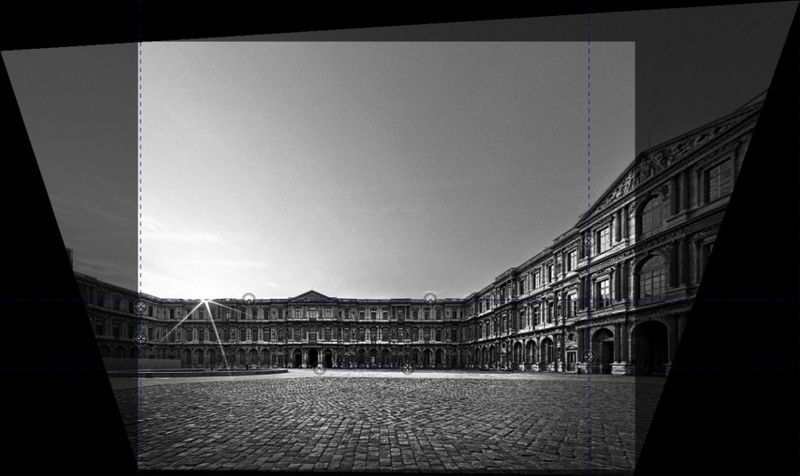 We advise you to check the optional “Constrain to image” box so as not to go beyond the visible borders of the image after the correction is applied.
. You have achieved a perfectly corrected image!